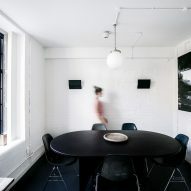 Architecture studio TDO has transformed a disused church hall in London into a versatile office for estate agent The Modern House, which feature lofty ceilings and modular furniture. The office is located in the borough of Southwark, set within a former church hall that dates back to 1931. Measuring at 231 square metres, the new open-plan workspace is intended to help The Modern House – which specialises in selling design-focused properties – accommodate their growing number of staff. 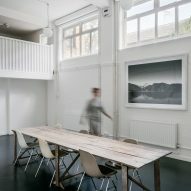 Before now the estate agent had been working out of an office in London's Islington, which had timber furnishings designed by Turner Prize-winning studio Assemble. 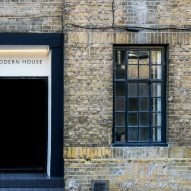 "The Modern House is expanding rapidly, and we had outgrown our previous workspace in Islington," explained Matt Gibberd, director of the company. "We were attracted to the utilitarian nature of the building, with its original Crittall windows and high ceilings, and saw this as an opportunity to strip it back to its shell and allow it to breathe again." Local practice TDO were brought on board to renovate the hall, which had largely fallen into disrepair since its adjoining church was demolished. Keeping the brief largely simple, Gibberd and his team only specified that the office should be versatile enough for them to host parties, talks, and exhibitions, as well as leisure activities like yoga and film screenings for staff. TDO used 3D modelling to create a modular desk system within one of the hall's double-height rooms. It comprises of a series black-coloured Valchromat panels that can be demounted from the walls and arranged into a variety of table formations to suit different office or event requirements. When not in use, the panels are intended to emulate "grand salon-style" boiserie. Surfaces in this room have otherwise been painted white and the original parquet floors have been restored. 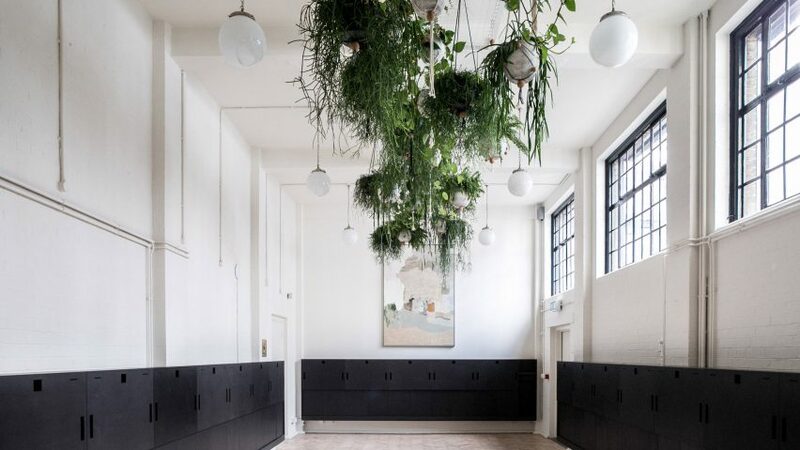 An array of vine plants also dangle down from a metal grid at the centre of the ceiling. "At TDO, small scale projects like this one for The Modern House are crucial for testing ideas and materials," said Tom Lewith, director of the studio. "As a practice we are interested in simple forms and intersecting geometries, and this project presented an opportunity to reconfigure simple sheet material into a bespoke and playful interior." Smaller rooms throughout the building have been converted into a kitchen, meeting area and dining space for employees. 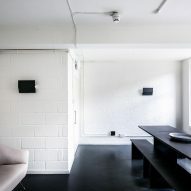 Each features a monochromatic colour scheme and has been dressed with original paintings by The Modern House's former clients like Irish artist Michael Craig-Martin, which also appeared in the old office. Earlier this year TDO teamed up with television presenter George Clarke to design a terrace of prefabricated houses in North Shields, England. The studio has also added a plywood-frame extension to a 19th-century Windsor cottage. Photography is by The Modern House.